It’s the fabulous World Book Night again! Such a great idea – giving books away to try to encourage more people to read and fall in love with reading. 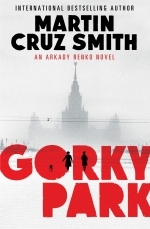 This year I have copies of ‘Gorky Park’ by Martin Cruz Smith to give away. I haven’t actually read it yet, but I’m looking forward to it as I enjoy Russian Cold War thrillers. I’m hoping it will be great; it’s quite a fat book to persuade non-readers to pick up! I’ve received books to give away every year and it’s a lovely feeling to share your love of reading with other people. In previous years, Mike and I have gone to World Book Night parties hosted by our brilliant local bookshop Booka, but unfortunately they aren’t running anything this year because they’ve had so many fab events with great authors over the past few weeks. Never mind, it’s probably for the best as I’m off work sick today, curled up in bed feeling quite sorry for myself, so we wouldn’t have been able to go anyway. I don’t think I’ll be giving away many copies of my book today either! I’ll post a review once I’ve read ‘Gorky Park’ and hopefully will find some deserving people to give my copies to over the next few days. Hopefully World Book Night will continue to run every year and will get the support and recognition it deserves.